The online marketing industry continues working hard earning its scummy reputation among lawyers . . . The example below is so outrageous that it looks like a parody. But its not. It’s real attorney advertising and someone is paying for it. (I know because I called and spoke to the attorney behind the site.) This started with a friend of mine in the SEO industry – Mike Blumenthal – who forwarded me an email with the subject line: gotta love the chutzpa. The logos above are sample only, we are not associated with these vendors. Hmmmm . . . the logos include the Better Business Bureau, the California Association for Justice, The Beverly Hills Bar Association and of course, my beloved Avvo. We know that third party endorsements go a long way to allay concerns of prospective clients of law firms, but this goes well beyond misleading. Note that the site looks like a law firm website, yet there is absolutely no personal information about an attorney or even a law firm name. The on-page optimization is horrendous – there are 13 instances of the phrase, “Los Angeles DUI”, keyword stuffed meta tags and of course, the exact match domain. Even the faux testimonials are keyword stuffed with SEO optimized internal links. And try reading the text here. Just about what I’d expect. 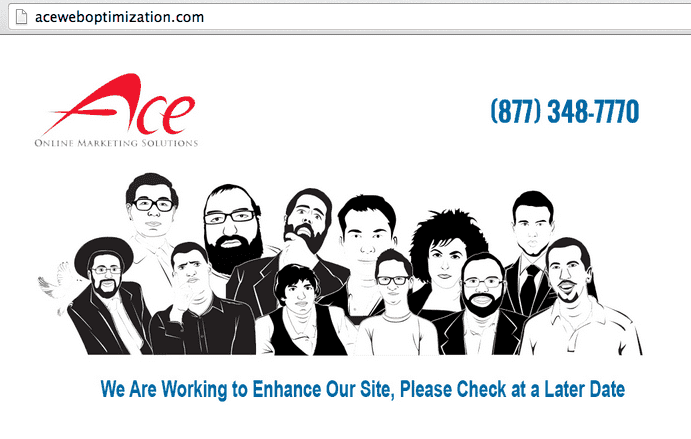 So I gave Ace a call to see if they offered online advertising. The guy who answered the phone assured me that he could get me ranking really high on the Internets. To Be Fair . . . .
My final step was to call the number on the DUI site itself . . . which was answered promptly and professionally (some of you could learn a lesson here) by an attorney. I forced some awkward conversation by asking for the name of his firm and his name (and vetted him on Avvo to see if he was, in fact really an attorney. The guy was helpful (assuming I had really just gotten out of jail on a DUI), compassionate and professional. For all I know he has no idea that some shoddy marketing firm is being so misleading on his behalf. Caveat emptor lawyers, caveat emptor. Update: Mike Blumenthal digs deep into how this site surfacing is a failure of Google’s Hummingbird. But how fast did he claim to be able to get you ranking really high on the internets? Also, did you ask “DUI Attorney Los Angeles” how his parents came up with that name? Is that greek? I’m not 100% what the problem here is. I see this as an excellent form of advertising for the web development company. There’s nothing illegal about them designing a website to drive traffic and capitalize on it when the law firm finds out about it. You might call it spam, but I see it as a savvy way of getting a new client. Mark – if you see falsely using Better Business Bureau accreditation as a “savvy way of getting a new client”, I can’t imagine what else you would employ as business practices. To each his own. Misleading, false representation and other “get a client at whatever cost” may appear to be clever and may get short term benefits. But how you do some things is how you typically do everything. I also assume you can sleep at nights. . .
Conrad, I would argue that it may not be legal or at least ethical for an attorney to be doing this. Attorneys are held to certain standards when it comes to marketing themselves. In fact in California for example, I would argue the fake trust signals violate the State Bar of California Rule 1-400 Advertising and Solicitation “Contain any matter, or present or arrange any matter in a manner or format which is false, deceptive, or which tends to confuse, deceive, or mislead the public”. This would include the fake Facebook shares. Although this is not the shadiest I have seen in the legal field It’s up there. I am still most bothered by the fact that Google is returning trash like this. Frustrating to see. Zero structured data and links from PHPLink Directory, “All the Links You Can Get”. I’ll give you one guess for the anchor text. Just one. Assuming your bar rules allow it, creating great testimonials (if they aren’t fake) is not really that difficult. We had our clients interviewed on video, then put their contact info (phone, email, etc.) beside each video: http://www.youtube.com/watch?v=-7_MK2ZwFUg.